On June 23, the people of the United Kingdom will have the opportunity to restore sovereignty and protect democracy by voting in a national referendum to leave the European Union. 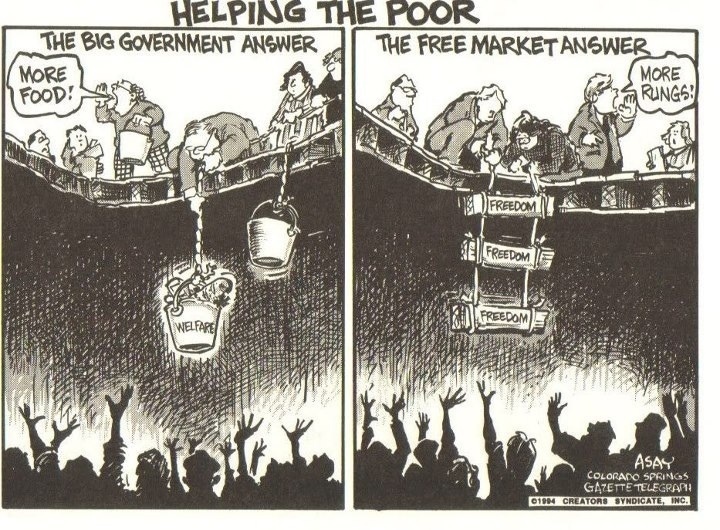 The European Union’s governmental manifestations (most notably, an über-powerful bureaucracy called the European Commission, a largely powerless but nonetheless expensive European Parliament, and a sovereignty-eroding European Court of Justice) are – on net – a force for statism rather than liberalization. 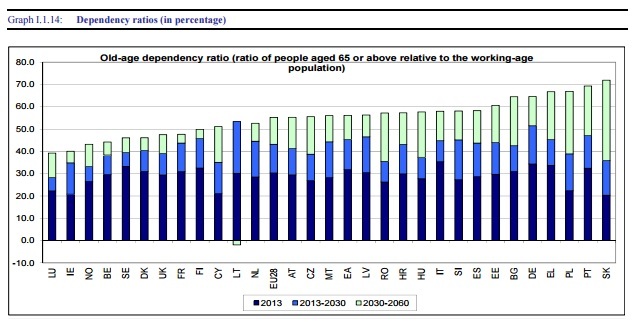 Combined with Europe’s grim demographic outlook, a decision to remain would guarantee a slow, gradual decline. A vote to leave, by contrast, would create uncertainty and anxiety in some quarters, but the United Kingdom would then have the ability to make decisions that will produce a more prosperous future. Leaving the EU would be like refinancing a mortgage when interest rates decline. In the first year or two, it might be more expensive because of one-time expenses. In the long run, though, it’s a wise decision. From an American perspective, George Will has been especially insightful and eloquent. Here are some excerpts from a recent column in the Washington Post. Here’s a good visual of what’s happening. What began as a good idea (free trade) has become a bad idea (economic union) and may become an even worse idea (common government). Here’s what Dan Hannan, a British Member of the European Parliament, wrote on the issue. He’s very pro-Europe, but understands that does not mean European-wide governance is a good idea. I’m emotionally drawn to Europe. I speak French and Spanish and have lived and worked all over the Continent. I’ve made many friends among…committed Euro-federalists. …they are also decent neighbours, loyal companions and generous hosts. I feel twinges of unease about disappointing them, especially the anglophiles. But, in the end, the head must rule the heart. Dan identifies six reasons why it is sensible to leave. Here are relevant portions of his arguments, starting with the fact that the EU is becoming a super-state.. The EU has acquired, one by one, the attributes and trappings of nationhood: a president and a foreign minister, citizenship and a passport, treaty-making powers, a criminal justice system, a written constitution, a flag and a national anthem. It is these things that Leavers object to, not the commerce and co-operation that we would continue to enjoy, as every neighbouring country does. 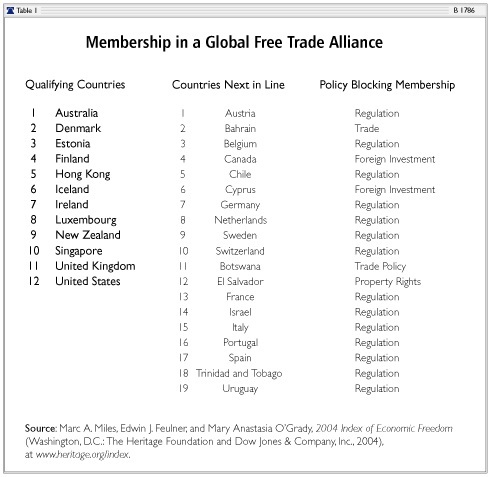 Second, it is only pro-trade for members, not the wider world. The EU is not a free-trade area; it is a customs union. The difference may seem technical, but it goes to the heart of the decision we face. Free-trade areas remove barriers between members and, economists agree, tend to make participants wealthier. Customs unions, by contrast, erect a common tariff wall around their members, who surrender the right to strike individual trade deals. …Britain is one of only two of 28 member states that sell more to the rest of the world than to the EU. We have always been especially badly penalised by the EU’s Common External Tariff. Unlike Switzerland, which enjoys free trade with the EU at the same time as striking agreements with China and other growing economies… It’s a costly failure. In 2006, the EU was taking 55 per cent of our exports; last year, it was down to 45 per cent. What will it be in 2030 — or 2050? Third, the advocates of common government are candid about their ultimate goals. The Five Presidents’ Report sets out a plan for the amalgamation of fiscal and economic policies… The Belgian commissioner Marianne Thyssen has a plan for what she calls ‘social union’ — i.e. harmonisation of welfare systems. …These are not the musings of outlandish federalist think tanks: they are formal policy statements by the people who run Brussels. …in 1973, the states that now make up the EU accounted for 36 per cent of the world economy. Last year, it was 17 per cent. Obviously, developing economies grow faster than advanced ones, but the EU has also been comprehensively outperformed by the United States, Canada, Australia and New Zealand. …Why tie ourselves to the world’s slowest-growing continent? Fifth, there are examples of very successful non-EU nations in Europe. …we can get a better deal than…Switzerland…and Norway…; on the day we left, we’d become the EU’s single biggest export market. …They trade freely with the EU…they are self-governing democracies. And last but not least, a decision to remain will be interpreted as a green light for more centralization, bureaucratization, and harmonization. A Remain vote will be…capitulation. Look at it from the point of view of a Euro-federalist. Britain would have demanded trivial reforms, failed to secure even those, and then voted to stay in on unchanged terms. After decades of growling and snarling, the bulldog would have rolled over and whimpered. …With the possibility of Brexit off the table, there will be a renewed push to integration, on everything from migrant quotas to a higher EU budget. Dan’s bottom line is very simple. We have created more jobs in the past five years than the other 27 states put together. How much bigger do we have to be, for heaven’s sake, before we can prosper under our own laws? Roland Smith, writing for the U.K.’s Adam Smith Institute, produced The Liberal Case for Leave. Needless to say, he’s looking at the issue from the classical liberal perspective, not the statist American version. Anyhow, here’s some of what he wrote. …the 1970s turned out to be an odd period where many things that seemed like good ideas at the time turned out not to be. …While there may have been an element of truth about EEC membership in the 1970s that seduced many subsequent sceptics…our timing for joining “the club” could not have been worse. …globalisation was beginning to eat into the logic of a political European Union at the very point it was striding towards statehood with a single euro currency. …the European single market is being rapidly eclipsed. …The EU is therefore increasingly becoming a pointless middleman as a vast new global single market takes over. 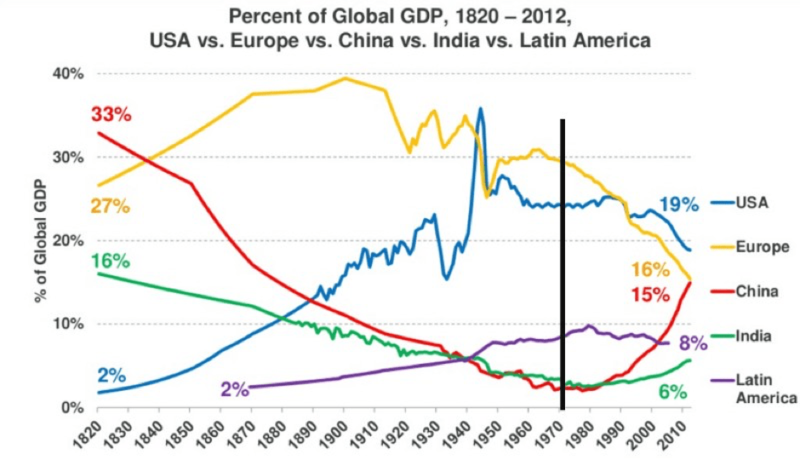 Here’s a chart from the article showing the European Union’s rapidly falling share of global economic output. Mr. Smith does not think it’s smart to link his country’s future to a declining bloc of nations. We are now less dependent than ever on our closest trading partners in Europe and this trend is marching relentlessly onward. For the first 40 years of our membership, the majority — over 60% — of UK exports went to the EU. But in 2012, for the first time, that figure dropped below 50%. It is now at 45% and continues to sink. …The demographics of the European continent, alongside the dysfunctional euro and its insidious effects across Europe have also played a large part in this change… This situation and these trends are not going to change. This Brexit vision is therefore a global, outward-looking and ambitiously positive one. It eschews the inward-looking outlook of…the Remain lobby… So a parochial inward-looking “little Europe” and a demographically declining one, ranged against an expansive, liberal and global outlook. …The crux of the matter is that we in Britain want trade and cooperation; our EU partners want merger and a leashed hinterland. These are strong arguments, so why does Prime Minister David Cameron want to remain? And why is he joined by the hard-left leader of the Labour Party (actually, that’s easy to answer given the shared leftist orientation of both Jeremy Corbyn and EU officials), along with most big companies and major unions? Most of them, if asked, will argue that a vote to leave the EU will undermine the economy. They’ll cite estimates of lower economic output from the International Monetary Fund, the Organization for Economic Cooperation and Development, the British Treasury, and other sources. To be blunt, these numbers lack credibility. A pro-centralization, pro-EU Prime Minister asked for numbers from a bureaucracy he controls. As critics have pointed out, the goal was to produce scary numbers rather than to produce real analysis. And the numbers from the international bureaucracies are even more laughable. The IMF is a left-wing organization with a dismal track record of sloppy and disingenuous output. And the OECD also is infamous for a statist perspective and dishonest data manipulation. Indeed, the palpable mendacity of these numbers has probably boomeranged on supporters of the EU. Polls show that voters don’t believe these hysterical and overwrought numbers. Yet, as reported by John Fund of National Review, the EU crowd is doubling down in their panic to frighten people. End of western civilization? Seriously? Gee, why not also predict a zombie apocalypse? These chicken little predictions are hard to take seriously when Britons can look at other nations in Europe that are prospering outside the European Union. Consider Norway. Advocates of the EU claimed horrible results if the country didn’t join. Needless to say, those horrible results never materialized. This doesn’t mean there aren’t honest people who sincerely think it would be a mistake to leave the European Union. Indeed, a survey by the Centre for Macroeconomics found very negative views. Almost all panel members thought that a vote for Brexit would lead to a significant disruption to financial markets and asset prices for several months, which would put the Bank of England on high alert. On top of the risk of a financial crisis in the near future, an unusually strong majority agree that there would be substantial negative long-term consequences. Other economists seem to agree. Four of them produced an article for VoxEU, and here’s some of what they wrote. The possibility of the UK leaving the EU has generated an unusual degree of consensus among economists. …analysis from the Bank of England, to the OECD, to academia has all shown that Brexit would make us economically worse off. The disagreement is mainly over the degree of impoverishment… The one exception is…Professor Patrick Minford of Cardiff University, who argues that Brexit will raise the UK’s welfare by 4% as a result of increased trade… Minford’s policy recommendation is that following a vote for Brexit, the UK should not bother striking new trade deals but instead unilaterally abolish all its import tariffs… we know of no cases where an industrialised country has ever implemented full unilateral liberalisation – and for good reason. Persuading other countries to reduce their trade barriers is easier if you can also say you’re going to reduce your own as part of the deal. If we’re committed to going naked into the world economy, other countries are unlikely to follow suit voluntarily. …In reality, the UK will still continue to trade extensively with our closest geographical neighbours, it’s just that the higher trade barriers mean that we will do less of it. Other establishment voices are convinced that the United Kingdom would be crazy to leave the EU. Robert Samuelson, in his Washington Post column, views it as a form of national suicide because of existing economic ties to continental Europe. Countries usually don’t knowingly commit economic suicide, but in Britain, millions seem ready to give it a try. 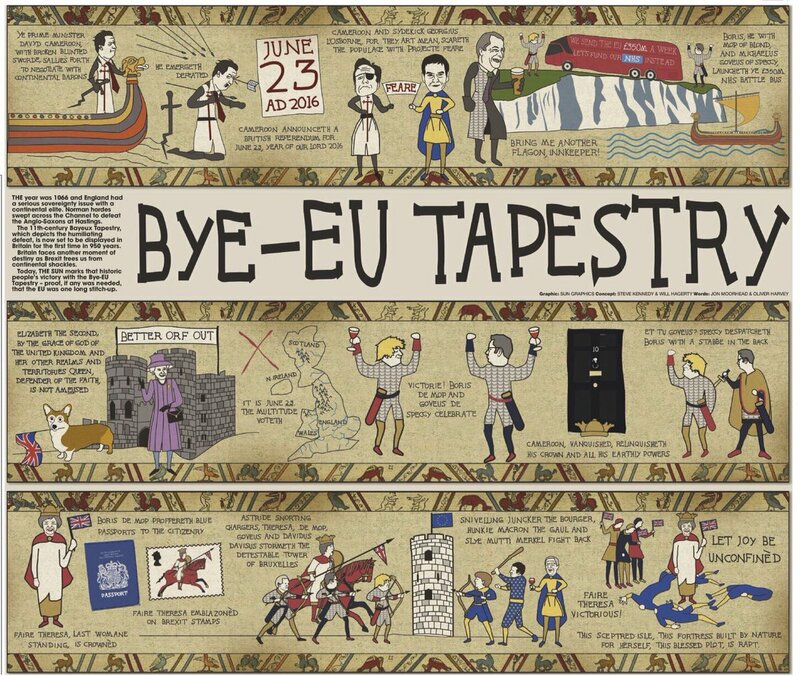 …Leaving the E.U. would be an act of national insanity. It would weaken the U.K. economy, one of Europe’s strongest. The E.U. absorbs 44 percent of Britain’s exports; these might suffer because trade barriers, now virtually nonexistent between the U.K. and other E.U. members, would probably rise. Meanwhile, Britain would become less attractive as a production platform for the rest of Europe, so that new foreign direct investment in the U.K. — now $1.5 trillion — would fall. Also threatened would be London’s status as Europe’s major financial center, home (for example) to 78 percent of E.U. foreign exchange trading. With the U.K. out of the E.U., some banking activities might move to Frankfurt or other cities. …Brexit is an absurdity. But it is a potentially destructive absurdity. It creates more uncertainty in a world awash in uncertainty. Allister Heath of the Daily Telegraph disagrees with these proponents of the status quo. David Cameron and George Osborne have been claiming, over and again, that those of us who support Brexit have lost the economic argument. …utter nonsense. …The free-market, cosmopolitan, pro-globalisation economic case for leaving is stronger than ever… The hysterical studies claiming that Brexit would ruin us are grotesque caricatures, attempts at portraying a post-Brexit Britain as a nation that suddenly decided to turn its back on free trade and foreigners. 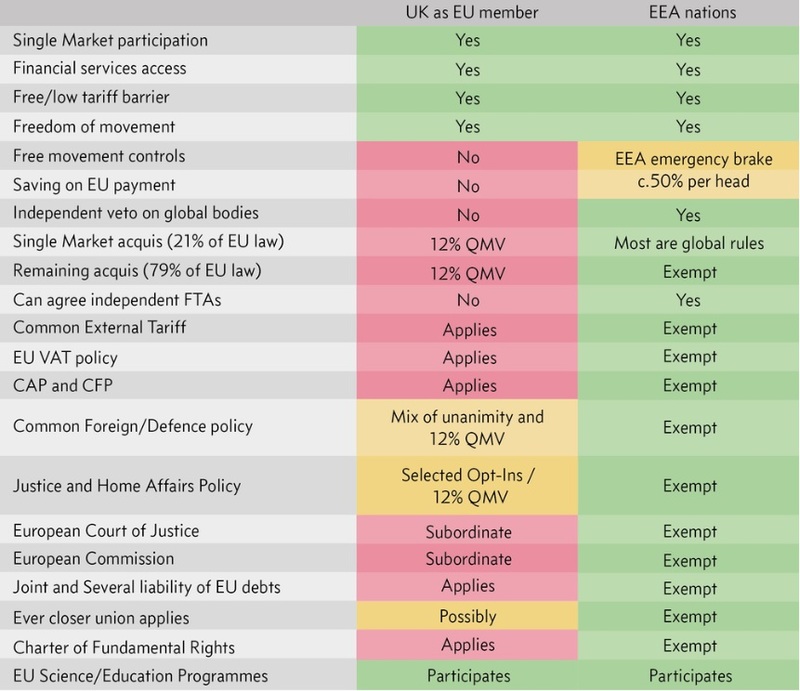 …a Brexit would almost certainly mean the UK remaining in the European Economic Area (EEA), like Norway: we would be liberated from much political interference, be allowed to forge our own free-trade deals while retaining the single market’s Four Freedoms. Europe’s shell-shocked corporate interests would demand economic and trade stability of its equally traumatised political classes, and they would get it. …with supply-side reforms at home, the UK would become more, rather than less, attractive to global capital. The Treasury, OECD and IMF’s concocted Armageddon scenarios wouldn’t materialise. Remain has only won the economic argument in the sense that most economists and the large institutions that employ them support their side. And Allister points out that the supposed consensus view of economists has been wildly wrong in the past. Time and time again, the majority of economists make spectacularly wrong calls, and it is a small, despised minority that gets it right. In 1999, The Economist wrote to the UK’s leading academic practitioners of the dismal science to find out whether it would be in our national economic interest to join the euro by 2004. Of the 165 who replied, 65 per cent said that it would. Even more depressingly, 73 per cent of those who actually specialised in the economics of the EU and of monetary union thought we should join – the experts among the experts were the most wrong. Britain would have gone bust had we listened… The vast majority of economists did not foresee or predict the financial crisis or the Great Recession or the eurozone crisis. Yet they now have the chutzpah to behave as if they should be treated like philosopher kings… Remember the Twenties? The economics profession overwhelmingly failed to see the great bubble and subsequent crash and depression. The Thirties? It messed up on just about everything. …In the Sixties and subsequently, Paul Samuelson’s best-selling, dominant economics textbook was predicting that the Soviet Union’s GDP per capita would soon catch up with America’s. The Seventies? Most economists didn’t know how stagflation could even be possible. The Eighties? The profession opposed Thatcherism and the policies that saved the UK; infamously, 364 economists attacked Thatcher’s macroeconomic policies in the 1981 Budget and then kept getting it wrong. …The problem this time around is that Remain economists assume that leaving the EU would mean reducing globalisation and halting most immigration. They assume that there are only costs and no benefits from leaving the EU…the EU’s anti-democratic institutions are unsustainable and thus pose a great threat to the liberal international economic order its UK supporters claim to be defending. The debate among economists is mostly focused on trade. With that in mind, this television exchange is very enlightening. In other words, nations all over the world trade very successfully without being in the European Union, so this view that somehow the United Kingdom can’t do likewise is a triumph of theory over reality. It’s way past time to wrap this up, but there are a few additional items I can’t resist sharing. A British parliamentarian (akin to a member of Congress in the U.S.) is understandably unhappy that some Americans, most notably President Obama, are interfering in the Brexit election. Here are parts of Chris Grayling’s column in the Washington Post. Imagine if you were told that the United States should join an American Union bringing together all the nations of North and South America. It would have its own parliament — maybe in Panama City, a place on the cusp of the two halves of the Americas. That American Parliament would have the power to make the majority of your laws. A Supreme Court of the Americas in Panama would outrank the U.S. Supreme Court and take decisions that would be mandatory in the United States. …That is, more or less, where Britain finds itself today. Sensible Americans obviously wouldn’t like that state of affairs. And we would be even more unhappy if that Superstate of the Americas kept grabbing more power, which is exactly what’s happening across the Atlantic. It decrees that any citizen of any European country can come and live and work in Britain — and that if they do, we must give them free health care and welfare support if they need it. Millions have done so. …it is moving closer and closer to becoming a single government for Europe, and indeed many of its key players — leaders such as Germany’s Angela Merkel and France’s François Hollande — have that as a clear goal. Britain has a small minority of the voting rights, and loses out almost every time. Allister Heath adds more wisdom to the discussion. He’s especially mystified by those who think the EU is a force for liberalization. Bizarrely, given the EU’s appalling record, these folk see Brussels as the last guardian of enlightenment values; the only way to save the project, they believe, is rule by a transnational nomenklatura. 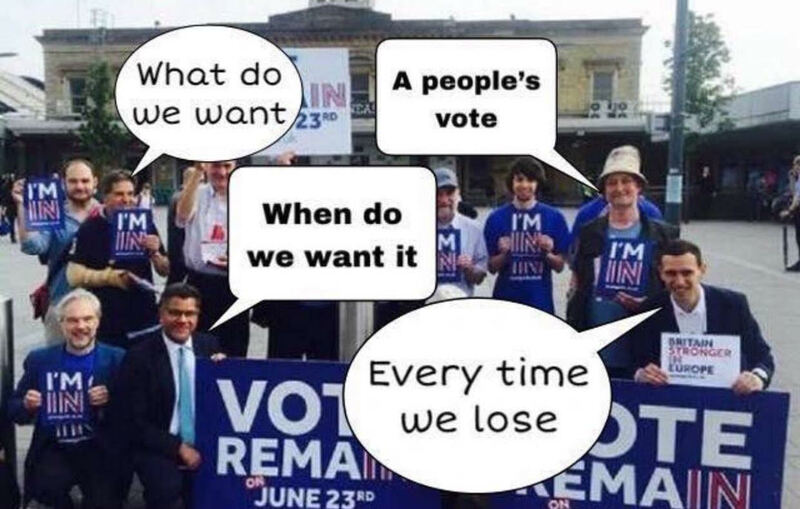 …Remainians are petrified that the British public would…vote the wrong way: for protectionism, nationalisation, xenophobia and stupidity. 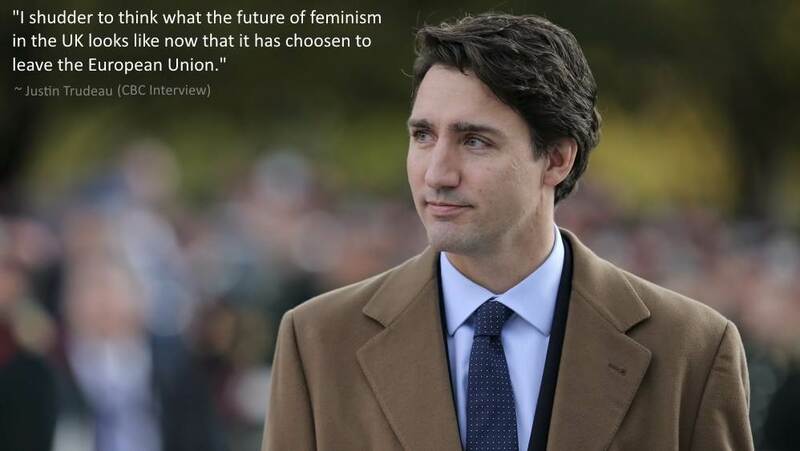 We would…support idiotic, growth-destroying and socially unacceptable policies. Astonishingly, given the Continent’s collectivist history, such folk equate membership of the EU with free trade and Britain’s Leave camp with protectionism. It’s a breathtaking error of judgement… They cannot grasp that there are other, better ways of opening markets than from within the EU, and that in any case it is just about as far from a libertarian project as it is possible to imagine. …pro-EU Left and Right agree that the people are dangerous, that they must be contained and that, slowly but surely, entire areas of public policy should be hived off beyond the reach of the British electorate. The strategy is to impose top-down restraints and to subcontract decision-making to external bodies… European institutions are actually the antithesis of true liberalism. Let’s end with some passages from another George Will column. Michael Gove, secretary of justice and leader of the campaign for Brexit — Britain’s withdrawal from the E.U. — anticipates a “galvanizing, liberating, empowering moment of patriotic renewal.” …American conservatives would regard Britain’s withdrawal from the E.U. as the healthy rejection of political grandiosity. …If Britons vote to remain in the E.U., this might be the last important decision made at British ballot boxes because important decisions will increasingly be made in Brussels. The E.U.’s “democracy deficit” is…the point of such a state. …Under Europe’s administrative state, Gove says “interest groups are stronger than ever” and they prefer social stasis to the uncertainties of societies that welcome the creative destruction of those interests that thrive by rent-seeking. 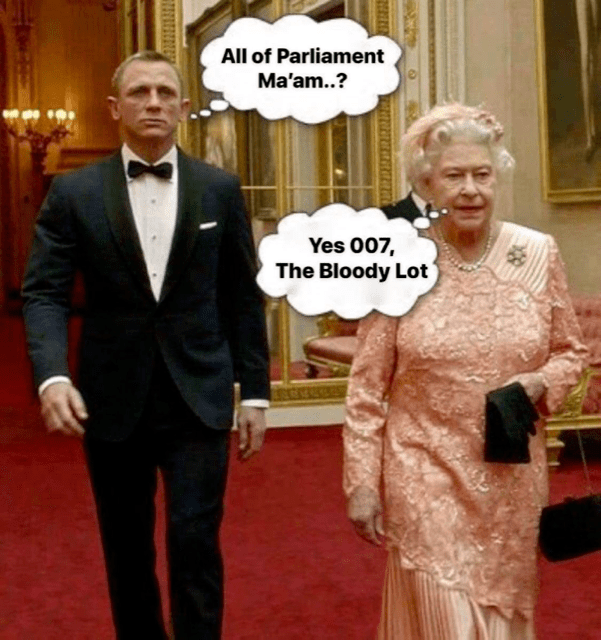 …most of binding law in Britain — estimates vary from 55 percent to 65 percent — arises not from the Parliament in Westminster but from the European Commission in Brussels. The E.U. has a flag no one salutes, an anthem no one sings, a president no one can name, a parliament that no one other than its members wants to have more power (which must be subtracted from national legislatures), a capital of coagulated bureaucracies that no one admires or controls, a currency that presupposes what neither does nor should exist (a European central government administering fiscal policy), and rules of fiscal behavior (limits on debt-to-gross domestic product ratios) that few if any members obey and none have been penalized for ignoring. …the 23rd of June can become Britain’s Fourth of July — a Declaration of Independence. If Britain rejects continuing complicity in the E.U. project — constructing a bland leviathan from surrendered national sovereignties — it will have…taken an off-ramp from the road to serfdom. If I lived in the United Kingdom, I would vote to leave the European Union. 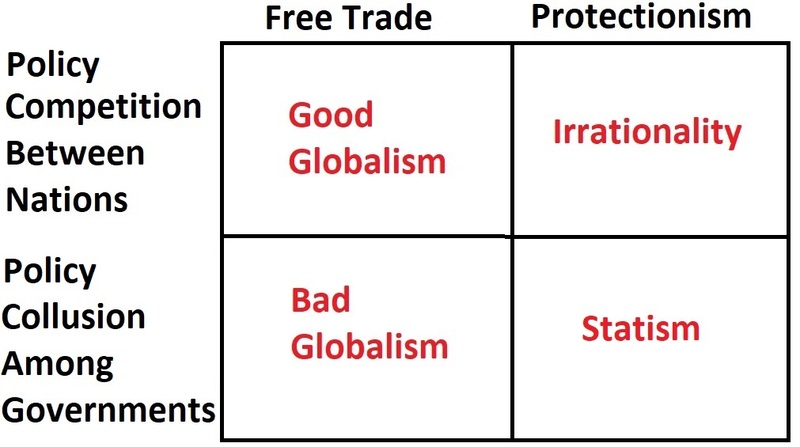 Simply stated, the European project is controlled by statists and the one good thing it provides (free trade between members) is easily overwhelmed by the negative things it imposes (protectionism against outsiders, tax harmonization, horrible agriculture subsidies, bad fisheries policy, etc). Moreover, the continent is demographically dying. 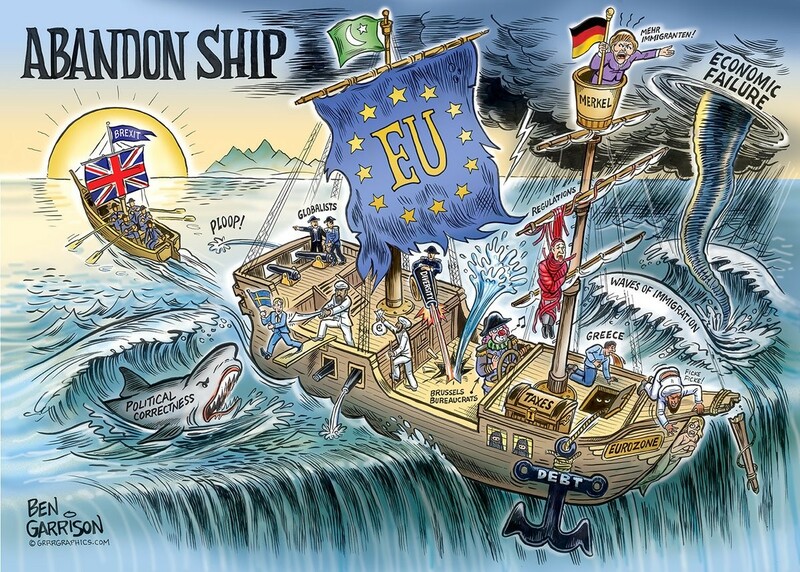 The bottom line is that the European Union is a sinking ship. This cartoon is a bit flamboyant, but it captures my overall sentiments. If I had lots of money and was confident of the outcome, I would learn the words to this song and fly to London so I could sing in celebration on June 23rd. Alas, just as I predicted the Scots wouldn’t vote for independence, I fear the scare campaign ultimately will succeed and Britons will vote to remain on the sinking ship of the European Union.